The United States Department of Transportation estimated that during 2014, the so-called "year of the selfie", 33,000 people were injured while driving and using a cell-phone in some fashion, which can include talking, listening, and "manual button/control actuation" including taking, uploading, downloading, editing, or opening of selfies. A 2015 survey by Erie Insurance Group found that 4% of all drivers admitted to taking selfies while driving. The Washington Post reported in January 2016 that "about half" of at least 27 "selfie related" deaths in 2015 had occurred in India. No official data on the number of people who died taking selfies in India exists, but reports show from 2014 up to August 2016, there have been at least 54 deaths in India while taking selfies. The Indian Ministry of Tourism asked states to identify and barricade ‘selfie danger’ areas, its first national attempt to deal with the selfie deaths. Mumbai Police identified at least 16 danger zones after a man drowned attempting to save a selfie-taker. No-selfie zones were also established in certain areas of the Kumbh Mela because organizers feared bottlenecks caused by selfie-takers could spark stampedes. A 2018 study of news reports showed that between October 2011 to November 2017, there were 259 selfie deaths in 137 incidents reported globally, with the highest occurrences in India followed by Russia, United States, and Pakistan. The mean age was 22.94 years old with male deaths outnumbering female about three to one. 9 March 2019 United States 1 Animal A woman was mauled by a jaguar in Arizona after entering a zoo enclosure to take a selfie. She received non-life-threatening injuries, including a large gash on her arm. Note: Although widely reported as a selfie incident, the victim claimed in a later CBS News interview that she was not taking a selfie, and did not enter the zoo enclosure—she only reached across a below-waist-height concrete planter in front of a much higher fenced enclosure—misleadingly termed "climbing" or "crossing" a barrier. ^ CNN, Naomi Ng, for. "Twitter declares 2014 year of the selfie". CNN. Retrieved 25 August 2016. ^ "The year of the selfie". www.google.ie. Retrieved 2016-08-25. ^ "Distracted Driving 2014 (DOT HS 812 260)". DOT NHTSA. April 2016. Retrieved 3 August 2016. ^ Ashley Halsey III (March 30, 2015). "Flossing, selfies, romantic encounters: Driving distractions, by the numbers". Washington Post. Retrieved August 3, 2016. ^ a b Gowen, Annie (14 January 2016). "More people died taking selfies in India last year than anywhere else in the world — The Washington Post". The Washington Post. Retrieved 6 March 2016. ^ a b "Freeze frame: States asked to spot 'selfie danger' areas". Hindustan Times. August 10, 2016. Retrieved August 10, 2016. ^ Bansal, Agam; el al (July 2018). "Selfies: A boon or bane?". Journal of Family Medicine and Primary Care. doi:10.4103/jfmpc.jfmpc_109_18. PMID 30234062. Retrieved 2 October 2018. ^ "Selfie Tragedy Forever Impacts Those Left Behind". InsideTrack. Union Pacific Railroad. 8 December 2016. Retrieved 28 June 2017. ^ Hollenhorst, John; Page, Jared; Romboy, Dennis; Leonard, Wendy (16 October 2011). "Utah County community mourns loss of teenagers hit by train". Deseret News. Retrieved 28 June 2017. ^ "Teenager leapt in front of Tube train after taking selfie called 'last pic before I die' inquest hears". Mirror. 10 August 2015. Retrieved 12 August 2016. ^ "Man dies while taking selfie on top of train". The Local (Spain). 18 March 2014. Retrieved 17 November 2015. ^ Withnall, Adam (27 April 2014). "Selfie crash death: Woman dies in head-on collision seconds after uploading pictures of herself and 'HAPPY' status to Facebook". The Independent. ^ "Woman Dies After Posting Selfie While Driving". The News Wheel. 27 August 2015. Retrieved 12 August 2016. ^ "Selfie deaths: six people who died taking a selfie". The Week UK. Retrieved 2019-03-11. ^ "Xenia Ignatyeva (1996-2014)- Find a Grave Memorial". Find a Grave. ^ Correspondent, By Akhel Mathew, (2014-05-22). "Selfie boy, 15, killed by train in Kerala". Retrieved 2016-08-28. ^ CNN, Ashley Fantz and Shawn Nottingham. "NTSB: Selfies likely caused Colorado plane crash". CNN. Retrieved 2019-03-11. ^ Mackay, Don (2014-06-12). "Teenager plunges 60ft to death onto rocks after 'trying to take selfie'". Retrieved 2016-08-28. ^ "15-year-old boy accidentally shoots self while taking selfie". ANC Yahoo News. 22 August 2014. Archived from the original on August 26, 2014. ^ Szathmary, Zoe (August 3, 2016). "Man accidentally kills himself with a shot to the head while posing for gun selfie on Facebook". Daily Mail. Retrieved August 16, 2016. ^ Moran, Lee (4 August 2014). "Mexican man accidentally shoots himself in head while posing for selfie". New York Daily News. Retrieved 14 March 2016. Oscar Otero Aguilar, 21, had reportedly been drinking with pals in Mexico City last weekend when he pointed the loaded gun at his face for the snap. ^ "Video: Polish couple killed in cliff fall after posing for 'selfies'". The Daily Telegraph. 11 August 2014. ^ "Selfie attempt atop stationary train claims Kerala teen's life". The Indian Express. 12 August 2014. Retrieved 25 January 2016. ^ Jacobs, Becky (February 24, 2016). "Man sentenced to 6 months in jail for killing cyclist in 2014 accident". Grand Forks Herald. Retrieved August 11, 2016. ^ Lazzaro, Sage (16 October 2014). "18-Year-Old Dies Attempting Beach Birthday Selfie". The New York Observer. ^ Corrales, Nestor (15 October 2014). "Selfie in front of Bangui windmills turns deadly". Philippine Daily Inquirer. ^ "Student drowns while trying to take selfie at Ilocos beach". GMA News Online. 14 October 2014. ^ Readhead, Harry (5 November 2014). "Tourist Sylwia Rajchel dies after falling from Puente de Triana bridge, Seville, taking selfie". Metro News. ^ Lazzaro, Sage (5 November 2014). "Tourist Falls to Death Taking Selfie on Puente de Trianak Bridge". The New York Observer. ^ "Joburg woman in deadly fall was on first date". News24. 19 January 2015. ^ "Tragic love story: Woman falls to her death while taking selfie on first date". The New Paper. 12 May 2015. ^ "Russia launches 'safe selfie' guide in light of deaths". aljazeera.com. 7 July 2015. ^ Mishra, Ishita (27 January 2015). "Selfie in front of running train costs three college-goers their life". The Times of India. ^ "Israeli plunges to death from India train while taking selfie". The Times of Israel. February 6, 2015. Retrieved August 12, 2016. ^ pmalatesta (February 23, 2015). "Man struck and killed by train while posing for selfie". WGN-TV. Retrieved August 11, 2016. ^ "Nagpur: Seven youths drown in lake while taking a selfie". ABP Live. Retrieved 17 November 2015. ^ Press Trust of India (23 March 2015). "Seven youths drown in lake". Business Standard. Retrieved 17 November 2015. ^ Smith, Dominic (April 9, 2015). "Film fan killed while taking selfie in front of train was 'trying to recreate favourite movie scene'". The Mirror. Retrieved August 11, 2016. ^ "German tourist dies in Italy selfie fall". The Local. April 2, 2015. Retrieved August 12, 2016. ^ Buchanan, Rose Troup (15 May 2015). "Romanian teenager dies attempting to take 'ultimate selfie'". The Independent. ^ "Death snap: Russia launches 'safe selfie' guide". The Sydney Morning Herald. 9 July 2015. ^ "Snuff selfie: 21yo Russian woman shoots self in head posing for photo". Russia Today. 23 May 2015. Retrieved 6 July 2015. ^ "Mt. Merapi to prepare selfie spot for visitors". Jakarta Post. 18 June 2015. ^ Muryanto, Bambang (17 May 2015). "Mt. Merapi climber falls into crater". Jakarta Post. ^ Erviani, Ni Komang (22 May 2015). "Singaporean dies when taking selfie in Bali". Jakarta Post. ^ "Pakistan Police Shoots 15-Year-Old Boy Taking Selfie with Toy Gun". NDTV. June 23, 2015. Retrieved August 12, 2016. ^ "Two teenage girls fighting for life after electric shock while trying to snap selfies on top of train". 11 June 2015. ^ a b "Be careful- A risky selfie can lead you to death". Daily Times. July 9, 2016. Retrieved July 11, 2016. ^ a b "Stop taking 'stupid and dangerous selfies' Croatia says after Canadian falls off cliff". CTV News. July 9, 2016. Retrieved July 11, 2016. ^ "21yo woman dies in fall from Moscow bridge while taking selfie". Russia Today. 4 July 2015. Retrieved 6 July 2015. ^ Carr, Simon (24 July 2015). "Rattlesnake selfie: Man nearly killed posing with snake for picture landed with £100k medical bill". mirror. ^ O'Connell, Oliver (22 July 2015). "San Diego's Todd Fassler who suffered rattlesnake bite given $153k medical bill". Daily Mail Online. ^ "Bison selfies are a bad idea: Tourist gored in Yellowstone as another photo goes awry". The Washington Post. Retrieved 23 July 2015. ^ "Man killed by lightning 'was carrying a selfie stick'". The Independent. 2015-07-07. Retrieved 2019-03-11. ^ "Balikbayan dies while taking 'selfie' on Pagudpud highway". GMA Network. July 22, 2015. Archived from the original on February 9, 2016. ^ Sobot, Rita (10 August 2015). "Man gored to death by bull while taking a 'selfie'". Retrieved 23 September 2015. ^ Kelly, Ross (2015-08-10). "Man Gored To Death While Taking Selfie During Running Of The Bulls". Retrieved 2019-03-11. ^ Xie, Qin (September 3, 2015). "Man fell off 100 foot cliff and died while taking photos of himself using a selfie stick". Daily Mail. Retrieved August 11, 2016. ^ Dolgov, Anna (2015-08-04). "Another Russian Teenager Dies While Trying to Take a Selfie on a Train". The Moscow Times. Retrieved 2019-03-11. ^ Golby, Joel (2 September 2015). "A Teenager Has Accidentally Shot Himself Dead While Taking a Selfie". Vice. Retrieved 17 November 2015. ^ "Japan tourist at Taj Mahal 'dies after fall'". BBC. 18 September 2015. Retrieved 23 September 2015. ^ "Schoolboy killed while taking extreme selfie". Yahoo! Canada. 29 September 2015. Retrieved 17 November 2015. ^ Piggott, Mark (September 30, 2015). "Selfie dangers: Teen falls 9 floors to his death as he poses on rooftop in Russia". International Business Times. Retrieved August 11, 2016. ^ "Engineering Student falls off cliff trying to take selfie, dies in TN". The Hindu. 29 September 2015. Retrieved 17 November 2015. ^ "Attempt to take selfie turns fatal for engineering student". India Today. 29 September 2015. Retrieved 17 November 2015. ^ "Un menor de 14 años resulta electrocutado cuando se hacía un selfi en el techo de un tren". 20 minutos. 19 October 2015. ^ Sobot, Rita (October 16, 2015). "Selfie-taking tourist dies in hospital after falling into boiling geyser". The Mirror. Retrieved August 11, 2016. ^ "2 engg students drown trying to take selfies in Surendranagar". The Times of India. 3 November 2015. Retrieved 21 September 2016. ^ Staff Reporter (28 November 2015). "One killed in accident while taking selfies on rail track". The Hindu. Retrieved 21 September 2016. ^ IANS (4 November 2015). "Mumbai schoolboy dies while taking selfie atop train". The Hindu. Retrieved 21 September 2016. ^ Liu Chuen Chen (4 November 2015). "Mumbai teen electrocuted to death while taking selfie atop train". India Today. Retrieved 21 September 2016. ^ "Young Pakistani man dies while attempting selfie with moving train". Al Arabiya News. 15 December 2015. Retrieved 21 September 2016. ^ Davies, Obalolu (December 30, 2015). "2 teens killed by a lorry after trying to take daring Selfie". Pulse. Retrieved August 11, 2016. ^ See, Aie Balagtas (January 5, 2016). "19-year-old student falls to death after taking selfies on Ermita roofdeck". newsinfo.inquirer.net. Philippine Daily Inquirer. Retrieved 2016-01-06. ^ "Corpo de turista que caiu no mar enquanto tirava 'selfie' é encontrado" (in Portuguese). Globo. 10 January 2016. Retrieved 2018-06-21. ^ "Jammu and Kashmir: Youth falls to death while taking selfie from Reasi Fort". The Indian Express. 9 January 2016. Retrieved 16 February 2016. ^ "College girl drowns in Bandra while taking selfies". The Times of India. Retrieved 16 February 2016. ^ "Woman drowns while taking selfie with friends at Bandra Bandstand". hindustantimes.com. Retrieved 16 February 2016. ^ "Mumbai Man Drowns Trying To Save A Girl Who Fell Off A Cliff Into The Sea While Taking Selfies". indiatimes.com. 2016-01-10. Retrieved 2019-03-11. ^ "Teen Taking Selfie Killed By Train in India". news.sky.com. Sky News. February 1, 2016. Retrieved 2016-02-01. ^ "Teen dies after 'freak' train selfie". 2016-02-01. Retrieved 2019-03-11. ^ "Karnataka: Three medical students drown in irrigation canal while taking selfies". The Indian Express. 13 February 2016. Retrieved 16 February 2016. ^ "Teenager Drowns While Clicking Selfie, Friend Dies Trying To Save Him". NDTV.com. 14 February 2016. Retrieved 16 February 2016. ^ "Nashik: Teen drowns in dam while taking selfie, friend dies saving". hindustantimes.com. Retrieved 16 February 2016. ^ "Dolphin was 'already dead' when crowd in Argentina handled it – tourist | Environment | The Guardian". The Guardian. Retrieved 25 February 2016. ^ "5 tourists fall off cliff while clicking selfie in Goa, 2 severely hurt". Hindustan Times. March 3, 2016. Retrieved June 16, 2016. Five tourists were recently injured – two of them severely – after falling off a cliff while clicking selfies at Anjuna village in Goa, police said on Thursday. ^ "Girl falls in Narayani while clicking selfie". The Himalayan Times. February 29, 2016. Retrieved October 5, 2016. ^ "Wash. man accidentally killed himself while taking a selfie with his gun, police say". The Washington Post. Retrieved 3 March 2016. ^ "Gun-toting selfie turns fatal". Daily Mail. August 3, 2016. Retrieved August 3, 2016. ^ Gannon, Genevieve (August 3, 2016). "Fatal selfie: Melbourne man dies taking photo of friend holding shotgun to his head". The Age. Retrieved August 3, 2016. ^ "Man falls to death trying to take selfie of a lifetime". Hong Kong Economic Journal. Retrieved 14 March 2016. ^ Sudhir, Uma (5 April 2016). "Teen Dies While Taking Selfie At Zoo A Day After Final Exam". Retrieved 23 April 2016. Manjeet and his family were near the butterfly park when he climbed a rock fountain almost three times his height, apparently to take a selfie from the top. ^ Express News Service (6 April 2016). "Another Selfie Death, This Time at Hyderabad Zoological Park". The New Indian Express. Retrieved 23 April 2016. At around 1.30 pm, the family reached the Butterfly Park when Manjeet entered the no-entry zone to risk a selfie. 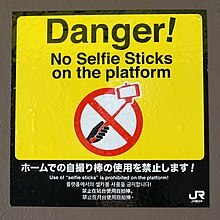 ^ "2 killed while taking selfie on railway tracks". The Times of India. 16 April 2016. Retrieved 23 April 2016. While returning from the temple, they stopped at the railway tracks to take selfies, said police. They got so engrossed in the act that they could not hear or see Brahmputra Mail approaching on the same tracks. ^ "Selfie perigosa: turista despenca 35 metros ao tirar foto em cachoeira" (in Portuguese). Noticias 7. 22 April 2016. Retrieved 2018-06-21. ^ "16-year-old boy dies while taking selfie at railway crossing in UP's Saharanpur". 16 April 2016. ^ "Mulher morre após cair de pedra em cachoeira em Campos, no RJ" (in Portuguese). Globo. 21 April 2016. Retrieved 2018-06-21. ^ Veerappan, Devanathan (26 April 2016). "Youth falls off Kodaikanal cliff while taking selfie". The Times of India. Retrieved 14 June 2016. ^ "Pathankot boy dies after shooting himself while taking a selfie". The Indian Express. 30 April 2016. Retrieved 2 May 2016. ^ "Indian teen dies after accidentally shooting himself while taking selfie". ^ "The most deadly selfie: Man killed while taking pictures with a 1.5-tonne WALRUS". The Daily Mail. 24 May 2016. Retrieved 28 May 2016. ^ "Selfie addiction sometime too dangerous to life". Ananda Bazar. 7 June 2016. Retrieved 7 June 2016. ^ Bell, Kim (June 7, 2016). "Overland teen fatally shot himself while taking selfie, police say". St. Louis Post-Dispatch. Retrieved 2016-06-07. ^ "Selfie on check dam drowns duo". The Times of India. 2016-06-14. Retrieved 2016-06-14. ^ Mai, Andy (June 20, 2016). "FDNY EMS lieutenant killed in upstate mountain climbing accident". NY Daily News. Retrieved August 6, 2016. ^ "EMT fatally falls off cliff while taking selfie". Fx Tribune. Retrieved August 6, 2016. ^ "Selfie In River Ganga Causes Death Of 7 Students". NDTV Convergence Limited. 23 June 2016. Retrieved 26 June 2016. ^ "Another selfie death? Youth falls off expressway bridge near Khandala, dies". Hindustan Times. June 23, 2016. Archived from the original on June 23, 2016. Retrieved July 27, 2016. ^ "Youth Falls to Death While Taking Selfie On Bridge". The Sisat Daily. June 24, 2016. Retrieved July 27, 2016. ^ a b Samuels, Gabriel (July 5, 2016). "Two tourists plunge to their deaths in Peru in separate selfie accidents". The Independent. Retrieved July 6, 2016. ^ "Tourist dies in Machu Picchu taking photo". June 30, 2016. Retrieved 2016-07-01. ^ The Tribune (2 July 2016). "Selfie costs man his life". tribuneindia.com. Retrieved 3 July 2016. ^ "Four selfie-taking youths killed in Madhya Pradesh flash floods". Times of India. July 6, 2016. Retrieved July 27, 2016. ^ Deshmukh, Chaitraly (July 13, 2016). "Clicking selfie claims another life! Mumbai boy falls in quarry at Khandala". Mid-Day. Retrieved July 27, 2016. ^ "Elephant kills Selfie photographers". Archy World News. July 13, 2016. Retrieved July 27, 2016. ^ "Two Selfie Lovers Died While clicking Selfie In Lalpur kosi Dam at Rampur". samacharplus.com. UP/Uttarakhand. July 13, 2016. Retrieved July 14, 2016. ^ "2 Vietnamese hit and killed by train while taking selfie". Thanhnien News. July 14, 2016. Retrieved July 27, 2016. ^ Sivarajah, Padmini (July 18, 2016). "Couple taking selfie swept away by giant wave in Kanyakumari". The Times of India. Archived from the original on July 18, 2016. Retrieved July 18, 2016. ^ "Selfie craze: Two killed after falling down Alekan waterfall". Udayavani. July 19, 2016. Retrieved July 27, 2016. ^ "Youth dies while taking selfie near falls". The Hindu. July 24, 2016. Retrieved July 27, 2016. ^ Singh, Kautilya (July 27, 2016). "Woman falls into river while taking selfie, dies". Times of India. Archived from the original on July 30, 2016. Retrieved July 29, 2016. ^ "National Level Athlete Dies While Taking Selfie". News18. July 31, 2016. Retrieved August 2, 2016. ^ "National level athlete dies while clicking selfie". Business Standard. July 31, 2016. Retrieved July 31, 2016. ^ Rai, Rajat (August 1, 2016). "Bhadohi wrestler, 24, dies while taking a 'reckless selfie' by the edge of Vindham Waterfall during a picnic". Daily Mail. Retrieved August 2, 2016. ^ Adhikari, Somak (August 2, 2016). "Another Selfie Death, This Time A Wrestler Drowns In A Waterfall". India Times. Retrieved August 2, 2016. ^ "Fla. woman shoots self while posing with gun for Snapchat". Palm Beach Post. August 2, 2016. Retrieved August 3, 2016. ^ "Selfie brings death to AP engineering student". The Hindu. August 5, 2016. Retrieved August 5, 2016. ^ "Women Dies After Falling Into Gorge to Take Selfie". Times of India. August 10, 2016. Archived from the original on August 10, 2016. Retrieved August 10, 2016. ^ "Pakistani girl, parents drown in latest selfie deaths". Daily Mail. August 16, 2016. Retrieved August 16, 2016. ^ "11-year-old girl, parents drown in selfie accident near Peshawar". Dawn. August 16, 2016. Retrieved August 16, 2016. ^ "Varsity bans selfies after student plunges to death". Times of India. Retrieved 14 August 2016. ^ "Indian teenagers swept into the sea while attempting to take a selfie". rushincrash.com. August 12, 2016. Retrieved August 14, 2016. ^ "Tamil Nadu: Selfie turns fatal, class 12 boy dies". Free Voice. August 16, 2016. Retrieved August 16, 2016. ^ "35-year-old accidentally shoots herself while taking selfie with a loaded gun". NewsX. August 17, 2016. Retrieved August 17, 2016. ^ Ali, Sarfraz (August 21, 2016). "Two more drown in latest selfie deaths in Kunhar River". Daily Pakistan. Retrieved August 21, 2016. ^ "Three women killed in avalanche while taking selfie near Saif-ul-Malook". Pakistan Today. August 21, 2016. Retrieved August 21, 2016. ^ "Distressing selfie incident claims three lives near Lake Saiful Malook". Daily Mail International. August 22, 2016. Retrieved August 22, 2016. ^ Srinivasa Rao Apparasu (September 18, 2016). "5 engineering students drown taking selfies in Telangana". Hindustan Times. Retrieved September 21, 2016. ^ "Selfie kills again, claims five engineering students lives near Dharmasagar reservoir". New Indian Express. 18 September 2016. Retrieved September 21, 2016. ^ "An Italian tourist got killed while attempting to take a selfie with an Elephant in Kenya". So True. September 20, 2016. Retrieved September 21, 2016. ^ "Boy falls into river while taking selfie". Kathmandu Post. October 2, 2016. Retrieved October 5, 2016. ^ "Selfie craze claims 2 lives in Hyderabad; teenagers drown in quarry". NewsX. October 3, 2016. Retrieved October 5, 2016. ^ "Selfie tragedy! Two Sri Lankan girls drown in Oman". Khaleej Times. 9 October 2016. Retrieved 9 October 2016. ^ Shaikh, Asseem (9 October 2016). "25-year-old falls to death in Lonavla while taking selfie". Times of India. Retrieved 9 October 2016. ^ "Chinese woman killed in Sri Lanka after falling from train". Xinhua News Agency. 9 October 2016. Retrieved 9 October 2016. ^ "Student missing in the river while snapping selfie – Anandabazar". Anandabazar. 13 October 2016. Retrieved 29 November 2016. ^ "Death by selfie: Software engineer drowns in Odisha". New Indian Express. 13 October 2016. Retrieved 29 November 2016. ^ "Girl, aged 12, dies after taking extreme selfie". BBC. 18 October 2016. Retrieved 29 November 2016. ^ "Telangana: Two students drown to death while taking selfie". News Crab. 12 November 2016. Retrieved 29 November 2016. ^ "Death by selfie: Two BTech students drown at Nagarjuna Sagar in Telangana". Hindustan Times. 12 November 2016. Retrieved 29 November 2016. ^ "Engg student dies while taking selfie in TN, hit by train he wanted in backdrop". hindustantimes.com. 1 January 2017. Retrieved 13 January 2017. ^ "'Killfie': Indian student dies after being hit by train while taking selfie". rt.com. Retrieved 13 January 2017. ^ "A man fell into River Indus and drowned on Wednesday (4th January 2017) as he tried to capture his selfie at the Lansdowne Bridge". www.geo.tv. Geo NEWS Pakistan. 4 January 2017. Retrieved 6 January 2016. ^ "For the death of a young man in Rijeka guilty – the selfie?". hr.n1info.com. 9 January 2017. Retrieved 9 January 2017. ^ NYOOOZ (5 February 2017). "22-yr-old falls into ravine while taking selfie, dies". nyoooz.com. Retrieved 5 February 2017. ^ ABP ANANDA (15 January 2017). "Youth dies after being hit by running train while taking selfie". Retrieved 21 January 2017 – via YouTube. ^ Yadav, Pankhuri (17 January 2017). "Train crushes 2 boys clicking selfies in Delhi – Times of India". IndiaTimes.com. Retrieved 21 January 2017. ^ "22-year-old crushed under train while taking selfie". IndiaTimes.com. 28 January 2017. Retrieved 5 February 2017. ^ "22-year-old falls into ravine while taking selfie, dies". IndiaTimes.com. 6 February 2017. Retrieved 6 February 2017. ^ England, Charlotte (9 February 2017). "Student posing for selfie swept to her death by fast flowing dam water". The Independent. Retrieved 14 February 2017. ^ Lagan, Bernard (9 February 2017). "'Selfie' student swept to death by dam torrent". The Times. Retrieved 14 February 2017. ^ "Teen cheerleader dies taking selfies in freak beach accident". New York Post. 27 March 2017. Retrieved 30 July 2017. ^ Amy Moss Strong (May 27, 2017). "Eugene girl dies after being trapped by log in surf in Bandon". Bandon Western World. Retrieved September 5, 2017. ^ "Una avioneta mata a dos jovencitas que se tomaban fotos en una pista de aterrizaje – Proceso". Proceso (in Spanish). 2017-03-27. Retrieved 2017-03-30. ^ "Air Strike Out". Darwin Awards. 25 March 2017. Retrieved 20 November 2017. ^ "Man falls off train for dramatic selfie, 4 friends die trying to save him". Hindustan Times. 14 April 2017. Retrieved 1 May 2017. ^ "Scot killed 'while taking selfie' on German motorway". BBC News. 1 May 2017. Retrieved 1 May 2017. ^ "Selfie in pond kills two, cops blame undercurrent". The Times of India. Retrieved 2017-05-25. ^ "Man crushed to death while attempting selfie before moving train – Times of India". The Times of India. Retrieved 2017-05-30. ^ "Odisha: Man injured after attempt to take selfie with wild elephant goes wrong". Hindustan Times. 7 June 2017. Retrieved 2018-05-05. ^ "Two brothers in Sri Lanka die while taking selfie on rail track". colombopage. 11 June 2017. Retrieved 13 June 2017. ^ "Killed in Primorye, the kids wanted to make selfi on the background of the train". Chelorg.com. 11 June 2017. Retrieved 11 June 2017. ^ "Selfie tragedy on Trans-Siberian rail line as three children killed by freight train". The Siberian Times. 12 June 2017. Retrieved 28 June 2017. ^ "Another selfie tragedy: Groom killed, bride injured". colombopage. 13 June 2017. Retrieved 13 June 2017. ^ a b c "Six children are killed within a week as they try to take 'the ultimate selfies' in spate of fatal accidents across russia". Daily Mail. 20 June 2017. ^ "Student fell off cliff 'posing for photo'". BBC News. 2017-10-12. Retrieved 2018-05-28. ^ Dalvi, Vinay Dalvivinay; Jun 29, Mumbai Mirror | Updated:; 2017; Ist, 11:58. "17-yr-old drowns off Marine Drive trying to take a selfie". Mumbai Mirror. Retrieved 2019-03-12. ^ "Selfie Leads To Tragic Death Of Two FUTA Students". Sahara Reporters. July 2, 2017. Retrieved July 5, 2017. ^ "Chennai: Bakery fire injures 48 onlookers standing too close, taking selfies". India Today. 17 July 2017. Retrieved 29 July 2017. ^ "Man Crushed To Death While Taking Selfie With Elephant". Huffington Post India. 27 July 2017. Retrieved 28 July 2017. ^ "Szelfizés közben zuhant le egy lány a Margit hídról". July 26, 2017. Retrieved July 26, 2017. ^ "Mumbai: 18-year-old Washed Away by High-Tide While Taking Selfie". India.com. 28 July 2017. Retrieved 29 July 2017. ^ "Teen taking selfie on train electrocuted, battling for life". Times of India. 11 August 2017. Retrieved 4 September 2017. ^ "Chennai: Teen's selfie stunt on train leads to death". Deccan Chronicle. 31 August 2017. Retrieved 4 September 2017. ^ Mohanty, Debabrata (2 September 2017). "Odisha youth tramped to death by elephant while taking selfie". Hindustan Times. Retrieved 2018-05-05. ^ "'Very rare complication' killed New Zealand woman after cycling selfie accident". Stuff.co.nz. 14 September 2017. Retrieved 24 November 2017. ^ "Man falls to death, believed to be taking 'selfie' at Genting Highlands ..." New Straits Times. 16 September 2017. Retrieved 17 November 2017. ^ "New Zealand woman dies taking selfie in London". 9Honey – Nine. 24 November 2017. Retrieved 24 November 2017. ^ "Joven muere al tomarse selfie en preso Malpaso de Aguascalientes". El Universar. 28 December 2017. Retrieved 28 December 2017. ^ "Horror on the Western Railway Station in Zagreb: The boy climbed to the roof of the wagon for selfie, struck by the current, and then ignited". Danas.hr. 9 January 2018. Retrieved 9 January 2018. ^ "Joven murió tras caer de una cascada cuando buscaba tomarse una selfie". El Tiempo. 11 January 2018. Retrieved 11 January 2018. ^ "Sickening moment man is smashed in the head by a train while trying to get the perfect selfie". The Sun (UK). 24 January 2018. Retrieved 24 January 2018. ^ Veazey, Simon (31 January 2018). "Footage That Prompted Indian Government Warning on 'Killfies' Could Be Fake". Epoch Times. Retrieved 2018-01-31. ^ Molloy, Mark (2018-02-09). "Woman killed posing for selfie on train tracks in Thailand". The Telegraph. ISSN 0307-1235. Retrieved 2018-02-09. ^ McGeehan, Patrick (March 26, 2018). "Passenger's Harness May Have Tripped Switch in Deadly Helicopter Crash". The New York Times. Retrieved December 17, 2018. ^ "16- year- old dies taking a selfie at Keratsini, Piraeus". Greek City Times. 21 April 2018. Retrieved 2018-05-04. ^ Costa, Catarina (23 April 2018). "Três jovens caem de ponte no Piauí ao tirar selfie e sofrem fraturas". O Globo. Retrieved 2018-04-24. ^ Soares, Ingrid (1 May 2018). "Homem se desequilibra ao tirar selfie, cai em lago e morre afogado" (in Portuguese). Correio Brazilense. Retrieved 2018-06-21. ^ Mohanty, Debabrata (3 May 2018). "Odisha man tries to click selfie with injured bear, is mauled to death". Hindustan Times. Retrieved 2018-05-04. ^ "Chinese tourist dies after falling from cliff taking a selfie". Jakarta Post. June 11, 2018. ^ Bratek, Rebecca (June 13, 2018). "Tourists taking selfie fall to their deaths in Portugal, officials say". CBS News. Retrieved 2018-06-20. ^ Hernandez, Lauren (September 6, 2018). "Teen from Israel reportedly dies in Yosemite after taking selfie atop Nevada Fall". SFGate. Retrieved 2018-09-06. ^ "Woman falls to her death taking selfies at Michigan landmark". Detroit Free Press. Retrieved 2018-10-03. ^ "Muere una mujer portuguesa en Panamá tras caer de un piso 27 mientras se hacía un "selfie"". abc (in Spanish). Retrieved 2018-10-13. ^ "Two die in fall from Yosemite Park vista; six fatalities in 2018". Retrieved 2018-10-30. ^ "Brother: Indians died in Yosemite fall while taking selfie". Retrieved 2018-10-30. ^ "German dies after falling off World's End in Sri Lanka trying to take selfie". Retrieved 2018-11-13. ^ "Student dies after falling from Cliffs of Moher while taking selfie". Retrieved 2019-01-04. ^ "Young man dies while taking selfie at Cliffs of Moher". Retrieved 2019-01-05. ^ "Jaguar attacks woman who crossed barrier for photo at Arizona zoo". CBS News. ^ "Grand Canyon: Tourist plunges to his death taking photos". Retrieved 2019-03-29. ^ "Fordham student critically injured in fall from clock tower". CNN. Retrieved April 14, 2019. Segan, Sascha (4 February 2015). "6 Lethal Selfies You Need to Learn From". PC Magazine. Retrieved 26 August 2015. "Selfie deaths: five people who died taking a selfie". The Week. 9 July 2015. Retrieved 26 August 2015. Basu, Tanya (February 5, 2016). "Here's a Breakdown of Selfie-Related Deaths". New York. Retrieved June 16, 2016. Basu, Tanya; Us, Science of (February 11, 2016). "How selfie-related deaths happen". CNN. Retrieved June 15, 2016. Torres, Kevin (March 8, 2016). "Startling statistic: More selfie deaths than shark-related deaths in 2015". KDVR. Retrieved June 15, 2016. "Selfie Obsession kills over 60 people Worldwide – Report". Phone Radar. 6 June 2016.